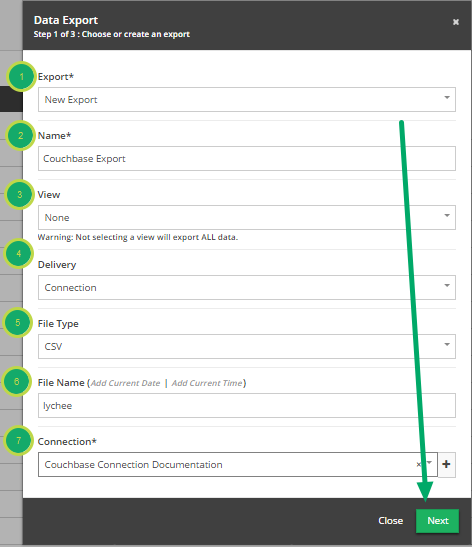 Documentation and SupportReleases Lychee Release Notes 2016-12-10Couchbase Connections Now Supported. 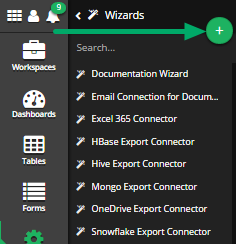 Click on the 'Wizards' System Tool. This will open the 'Add New Wizard' modal. 1.3. Enter information into the 'Add New Wizard' modal. Name: The name that this Connection will be stored under. Description: An overview of the Connection. Any additional information can be stored here. Hostname: The Couchbase host to connect to. 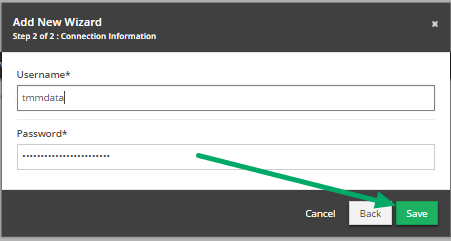 When finished filling out the information, click 'Next' to continue. 1.4. Enter your Couchbase username and password. 1.5. Congratulations! You are now ready to use this Connection in the TMMData System. 2. Export data from Table using Couchbase Connection. 2.2. 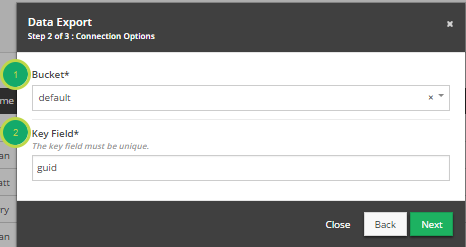 Fill out information in 'Data Export' modal. Name: The Name of this Export. View: Which View to use for this Export or 'None' to Export all data. File Type: How should the Export format the data file? File Name: The Name of the Exported file. Connection: Choose the Connection that was created above. This will execute the Export. 2.5. Congratulations! You have exported a Table to Couchbase. 3. 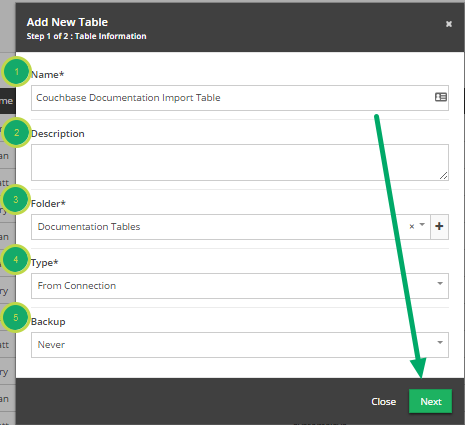 Create Table using Couchbase Connection. 3.1. Open the 'Add New Table' modal. 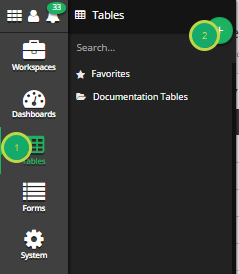 Click the 'Tables' System icon. 3.2. Fill out 'Add New Table' modal. Description: An overview explaining the Table. Folder: Which folder to store the Table in. Backup: How often, if at all, should this Table be backed up? Connection: The connection to use for the import. Table Upload Frequency: How often should the Table be refreshed. Buckets: The bucket to use for this Table. Document: You may type the exact key for a document. This document will be used to generate the appropriate fields. If you leave this blank, the first document will be used as default. 3.4. Congratulations! 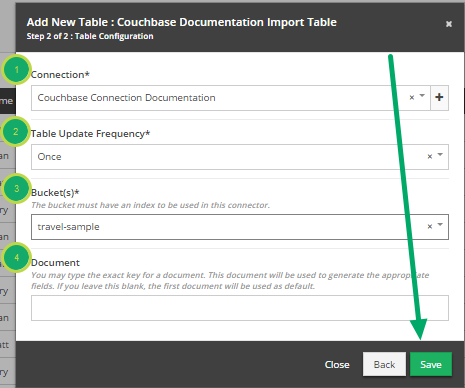 You have just created a Table using a Couchbase Connection. Prev: Snowflake Support Now Includes Import in Addition to Export. Next: Email Export Connector Now Available.